Interior: 4 lockers on left side and 2 lockers and shelf on right. Right side rotary hopper into locker with dual keylock. 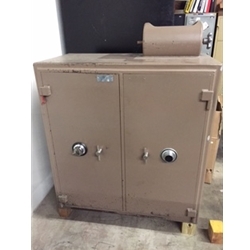 2nd locker with envelope drop and digital lock. Left side 4 lockers. I.D. 7 X1 4 1/2 X 10, digital lock and open area 8 x 18 1/2 x 17.